It was just before dawn, and a crisp cold breeze seeped in through the glass doors of the hotel foyer. 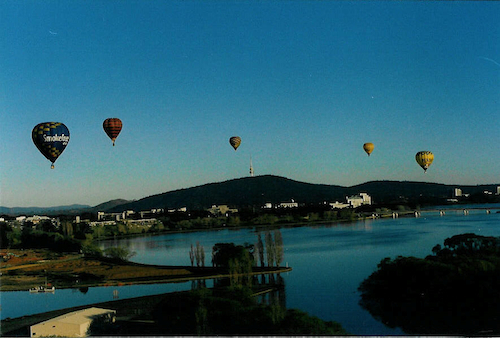 A half dozen voyagers had assembled, bleary-eyed, at the Hyatt Hotel in Canberra, to meet the crew of Balloon Aloft. Outside, an elderly four-wheel drive manoeuvred into position, trailing behind it a mysterious, gloom-shrouded package. We hurried aboard and were driven to the top of a nearby hill where our pilot, Alan, let off a couple of small black helium balloons and carefully watched as they zigzagged back and forth through the air streams. After a brief discussion, Alan and his ground crew, Rod, agreed on this mornings launch site, and we all piled back in for the journey back down the mountain. The site that they had chosen was a piece of waste ground on the edge of the city, and it was already filling up with balloonists both private and commercial; obviously everybody had come to similar decisions about their launch site. We found a space in the middle and all mucked in to help unpack our craft. First came the basket, sturdily constructed from wicker, and divided internally into three compartments, one for the pilot and gas tanks, and the others for passengers. Then came an enormous bag, from which we unrolled the nylon canopy onto the frost-coated grass, a long worm trailing from the basket and out across the field. Finally we unlimbered a small petrol generator and a large electric fan. While I held open the canopy, the fan pumped cold air inside, so that the whole thing started to billow and to slowly unfurl into a bit squashy sausage. The rushing air was very cold, and I was glad of my gloves, but while I was standing there the pilot was rigging the gas bottles to the burners on top of the basket. Since the basket was lying on its side, the burners were aimed straight past me into the hole in the canopy. After a brief warning, the pilot lit the gas and a huge roiling flame roared past me and into the balloon. Suddenly I wasn’t cold at all. Slowly the balloon began to take shape. The crew poked around pulling out folds and making sure that the control lines were not tangled, until the whole canopy lifted up and rolled the basket upright. We all jumped on to it to keep it on the ground and then clambered in. 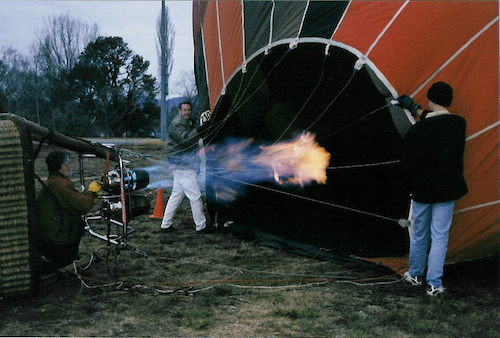 The basket was untethered from the 4WD, the pilot let off a stream of flame into the canopy, and we were airborne. At about a thousand feet, Alan switched off the flame and everything went quiet and still. The patchwork quilt of the land below drifted silently by, and the sun warmed our frosted fingers. Since we were drifting with the wind, there was no breeze in the balloon. Those few sounds that we could hear from the ground came with startling crystal clarity. 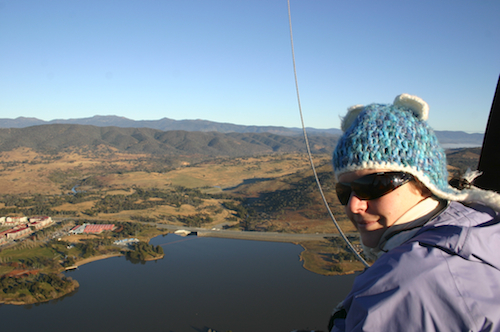 Alan did a courtesy radio check with the local airports tower, and then took us up to three thousand feet, where an air stream pushed us in the direction he wanted, right across the centre of Canberra. From that initial hilltop exercise with the helium balloon, he had formed a mental picture of all the criss-crossing air streams above, and could steer us in any of a number of different directions simply by changing altitude. Far from being at the mercy of the elements, balloons can be flown with pinpoint accuracy. Alan explained that when they aren’t taking paying passengers, he and his fellow balloonists often compete in balloon trials, flying from way point to way point and fulfilling tasks such as tossing a bean-bag onto a target on the ground, or picking up a handkerchief from the grass. Others practice bouncing off the water of the lake. We were not competing, of course, we were just along for the ride. 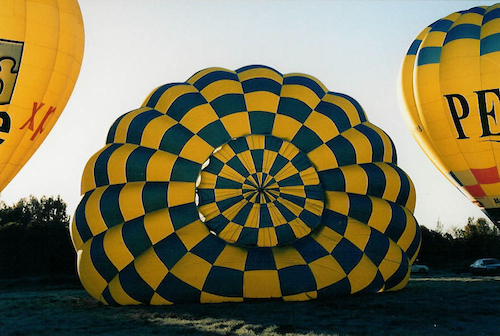 Ballooning is a beautiful way to travel. Even sufferers of vertigo have nothing to worry about. The basket feels rock solid underfoot, and does not swing or flex. The ground drifts by below, looking more like a map than the territory, and there is no real impression of height, just of peace and calm. Our views to the Brindabella hills were breathtaking. As we drifted in over the suburbs, we began to hear dogs barking. This seems to be a peculiarity of dogs; they bark when a balloon passes over their house, even if they are inside and the gas burner is quiet. Nobody knows how they detect the balloon floating silently far above the rooftops, but they do. Eventually, however, the trip had to end. Once the sun gets too high in the sky, the thermoclines start up and ballooning becomes less predictable. Alan took careful note of the wind direction and called Rod, who had been patiently dogging us in the car below, parking up at intervals and waiting on various roadside verges for us to sail overhead. We were going to land on a rugby field that they happened to know had a broken lock on the gate which meant that they could get the car onto the pitch. 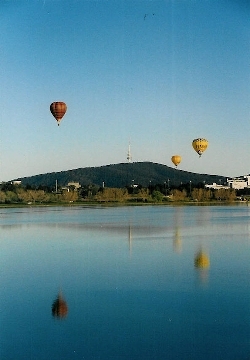 The two of them have an encyclopaedic knowledge of the accessible green areas of Canberra, but even so, Alan said that sometimes they had to put down somewhere inconvenient which meant carrying the balloon out and/or bribing the landowner with champagne to open the gate for them. There are control lines that lead to a vent in the canopy that can be used to spin the balloon around or, as now, to let hot air out of the top in order to lose height. We dropped gently down, just clearing the rugby goal posts, and threw a line to Rod, who guided us down the last few tens of metres. I’ve caught a big one! Just in case the basket tipped over onto its side or got dragged along on the ground, we all adopted the landing position, which involved crouching down in the basket, hanging on, and waiting for everything to stop moving. The actual landing was very gentle, and it looked for a moment as if the basket was going to stay upright, but it gently rolled over onto its side, still buoyed by the remaining hot air in the canopy. Rod fought a little with the huge bag, but finally managed to wrestle it to the ground, and one by one we hopped out to help. 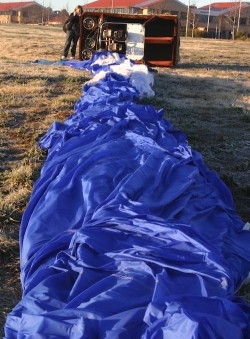 Repacking the balloon is quite easy with half a dozen willing volunteers, but must be hard work with only two people. First it is squashed up into a long sausage, and then it is carried and crammed, armful by armful, into the bag from which it came. Naturally it still contains a lot air, so we ended up with a laughing pile of people all rolling about on top, trying to get the last few metres under control. Finally we hoisted bag and basket onto the trailer, and piled happily back into the truck. It was just about time for normal people to be getting up out of bed, and we knew that back at the Hyatt there was champagne waiting to help us to start our day. This entry was posted in Australia, Oceania, Travel on 2007/07/22 by Reinhard.